Patients seeking a Pasadena dentist who has a variety of cosmetic treatments available are encouraged to work with Dr. Vasag Bouzoghlanian. His practice is equipped with the latest techniques and modalities for improving the smile, including solutions for teeth straightening such as Invisalign. Pasadena area patients love the benefits of Invisalign. Healthy gums. Patients who undergo Invisalign treatment will enjoy the benefits of healthy gums because their smile is easier to clean and care for. Easier teeth cleanings. Traditional metal bracket and wire braces make it incredibly difficult to keep the teeth clean during treatment because of all the spaces and crevices where food particles can get stuck. Flossing is also more difficult. With Invisalign, patients remove their trays to care for their smile without the inconvenience of brackets and wires to work around. Better bite function. When the bite is properly aligned, it is easier and more comfortable to eat and speak. Reduced risk of teeth grinding. Conditions such as bruxism are often caused by poor bite alignment. Bruxism is involuntary clenching and grinding of the teeth which can wear down the natural teeth and break restorations. Bruxism is also linked to temporomandibular joint disorder, or TMD, a condition that is often reduced with orthodontic treatment. Improvement in speech. It is easier to speak when the natural teeth are in alignment and patients are free from gaps and spaces within their smile. Cosmetic improvement. 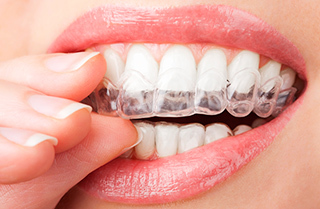 One of the most common reasons why patients consider Invisalign is to address aesthetic problems such as gaps between their teeth, misaligned teeth, or poor bite alignment. Ready to discuss Invisalign with your cosmetic dentist in Pasadena? Call Dr. Vasag Bouzoghlanian and his team today by calling (626) 577-2017 and visiting the practice at 1060 East Green Street, Suite #203. Our practice is here to assist patients in and around the community with their oral health care needs, as well as cosmetic treatments such as teeth straightening with Invisalign orthodontics.